Macau-Bangkok - business class. The airline changed its departure time without notifying me from 6pm to 11:30pm! Fortunately I found out by accident. My experience with the ground crew and Macau airport personnel was similar - poor or no English. The Business Class Lounge lady told me "no more food go downstairs". When I went to the restaurant there was almost no food left. We finally departed at almost 12:00 midnight amidst great confusion. Onboard the service was very polite the food was ample but mediocre entertainment system was retro with service announcements that seemed to occur every 15 minutes. Air Macau is not cheap. The only advantage of Air Macau is that if you are going to Macau you avoid having to take the ferry from HK otherwise skip this one. I flew Air Macau SHA-MFM-TPE-MFM-SHA. The service was OK; the FA's spoke all English and were very polite. 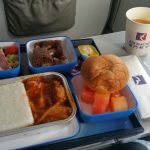 The food was good compared to other small Asian airlines. Only the ground staff was rude impatient and the English poor. On the flight from MFM to SHA the plane took of without one piece of luggage! We had to wait 2 hours for the luggage to arrive in SHA. Nobody of the ground staff spoke English; I had to ask a passenger to translate. As Air Macau's prices are not cheap at all it's a shame how they treat their passengers especially on the ground. I had a trip to Beijing with Air Macau. The first flight from Taipei to Macau. The cabin clean and new but the seat small. The service of cabin crews is bad. They never smile during the flight. When they took the meal to passengers they didn't say thanks or you are welcome. The breakfast was poor. Next flight was from Macau to Beijing. I changed aircraft and cabin crew on this flight. This aircraft is larger but the seat and service was still bad. A crew was really impatient when I wanted to buy some duty-free items. The entertainment was poor. They didn't have movies on a three hour flight. The program was almost the same as TPE/MFM flight. The third flight from Beijing to Maca - a very excellent flight. Cabin crew friendly and polite - food was delicious. My last flight from Macau to Taipei. Bad service bad food and bad entertainment. Air Macau earns a lot of money flying between Taiwan and China. I think they should improve most of their service (seat pitch entertainment meal etc.). They should educate cabin crews to be more courteous to passengers. Their service is worse than EVA Air and TransAsia Airways on TPE-MFM route. A very good airline! Flew Macau to Beijing and back. 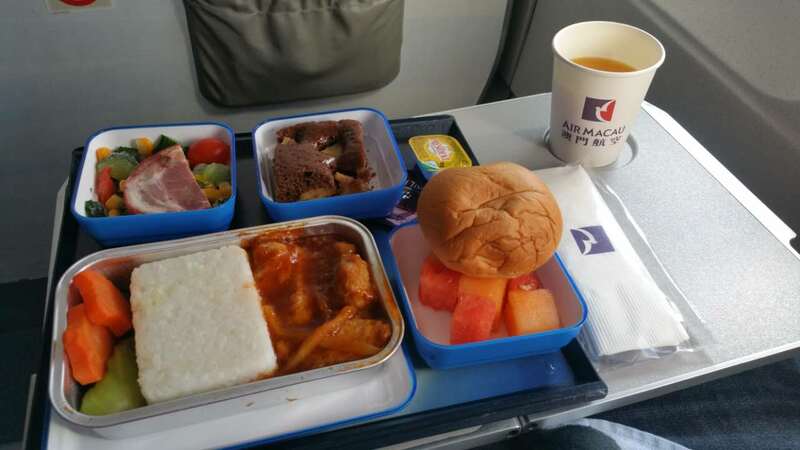 The plane was new and clean but the food was poor-noodles in a brown sauce and a vanilla cake. The cabin staff however were great! They all spoke English they were polite and well dressed and they found American magazines for us to read being the only Western pax on board. I just completed a round trip on SIN to MFM by Air Macau two days ago. The aircrafts (A319 and A321 ) are new and clean. The pilot gave comprehensive flying details in English and the cabin staff repeated the pilot comment in Chinese. This is good service as Air Macau is highly dependent on Taiwanese and China market exclusively where the passenger may not understand the pilot comments. The cabin staff are attentive and respond fast to the passenger demand. Food is good and the seat is comfortable. One setback is the flight entertainment. They have no movie shown onboard except for a short documentary show last for about one hour. I guess Air Macau majority Flight times are normally less than 2.5 hours and the time may not permit a movie program. Maybe they should consider to feature movie programs for flight to Beijing Kuala Lumpur and Singapore. Overall Air Macau a relative new airline with only 9 years of operation has done well and I will fly with them again.